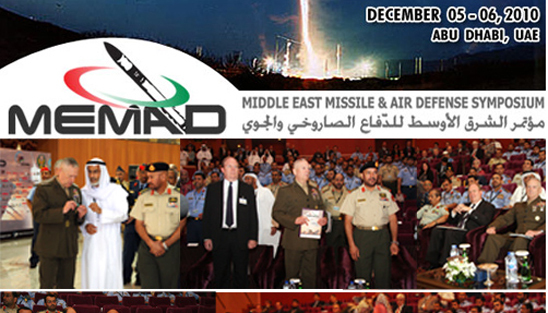 For its second edition, MEMAD returned to Abu Dhabi on December 5-6, 2010 as the region’s leading event gathering the most enlightened policymakers and missile defense experts from around the world to discuss the absolute cutting edge in multi-layered missile defense technologies. 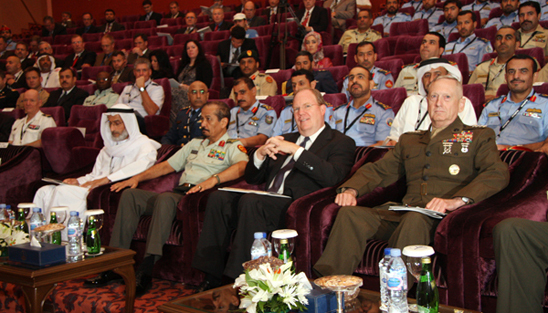 The two-day event was attended at the opening by a crowd of political and military leaders and diplomats from the Gulf region and abroad. 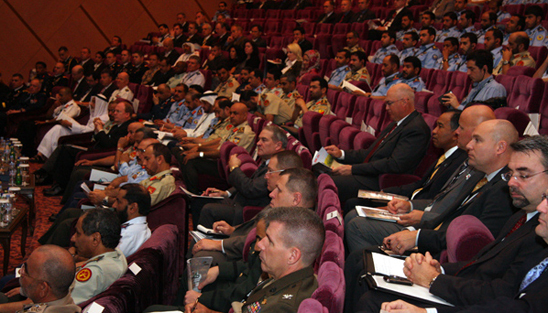 The first day included an opening session and three plenary sessions. 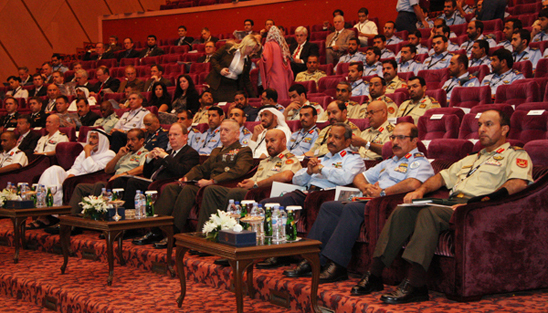 Under the Patronage of His Highness Sheikh Mohammed bin Zayed Al Nahyan, Crown Prince of Abu Dhabi and Deputy Supreme Commander of the UAE Armed Forces, the Middle East Missile and Air Defense Symposium (MEMAD) was established in 2008 by INEGMA to facilitate decision-makers from militaries and missile defense agency’s around the Middle East to plan and prepare for the most effective missile and air defense systems anywhere in the word. MEMAD uniquely blends the latest insights from government, industry and academia to create the most comprehensive forum for understanding critical challenges of emergent missile threats through examining state-of-the-art integrated air defense systems against the full spectrum of missile and air threats. 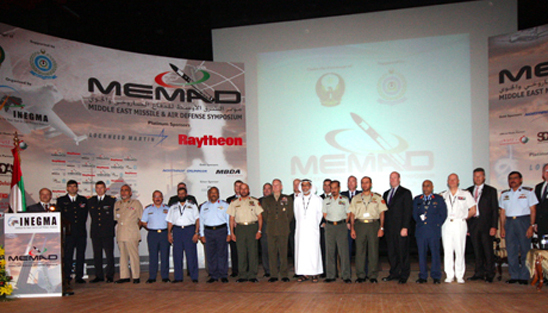 As the first dedicated missile defense event in the Middle East, MEMAD set the benchmark with a remarkable agenda that provided in-depth insights into key strategic themes and unparalleled guidance on developing multi-layered missile defense systems for the emerging missile and air threats environment. Highly focused closed roundtables hosted in the company of leading missile defense experts ensured participants were exposed to the latest critical developments in missile interceptor technologies. 10:15-10:40 "Regional Integrated Air and Missile Defense – The Operational Picture"
10:40-11:05 "Region-Specific Challenges in Building an Integrated Missile Defense Shield"
11:05-11:30 "A Regional Approach to Missile Defense - The Center for Integrated Air and Missile Defense"
12:15-12:40 "Ballistic Missile Defense Overview"
12:40-13:05 "Maritime Assets and Interoperability in the AMD System"
13:05-13:30 "Integrated Air & Missile Defense - A Theater Imperativ"
14:15-14:40 "UAE Network Enabled Capability: A Local Solution to a Global Problem"
14:40-15:05 "BMC2 Interoperability and Integration"
09:05-09:30 "Adapting to Seize the Opportunities of Technology"
09:30-09:55 "Reducing Risks and Consequences with the Deployment of Theatre Ballistic Missile Defense"
09:55-10:20 "Developments in Regional Threat Environment and Interoperability"
11:05-11:30 "Integrated Air Defense – A Swedish Perspective"
11:30-11:55 "US Army Missiles Overview"
11:55-12:20 "Consolidating Extended Low Tier Air Defense"
The opening session started with a brief welcome note by INEGMA CEO, Mr. Riad Kahwaji who stressed the importance of the Symposium as missiles constitute a real threat to the stability of the GCC countries. The first keynote speech was delivered by His Excellency Major General Ali Mohammed Subaih Al Ka'abi, Deputy Chief of Staff of the UAE Armed Forces. 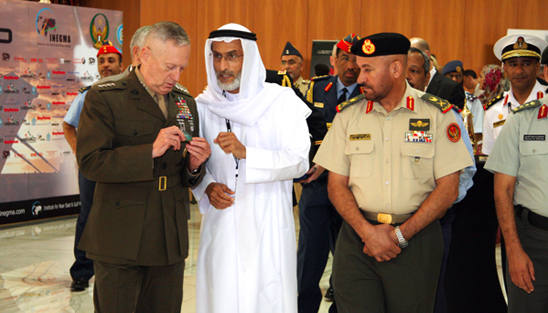 He welcomed the attending delegates in the UAE, and discussed theater ballistic missile potential to reach over land and water. He added that the key problem is that the WMD capability is increasing. 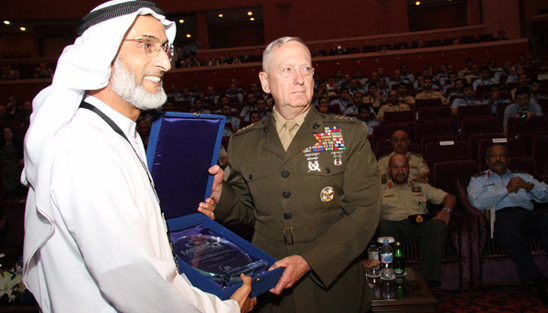 He also said that an integrated missile defense Center of Excellence along with CENTCOM is now a reality. 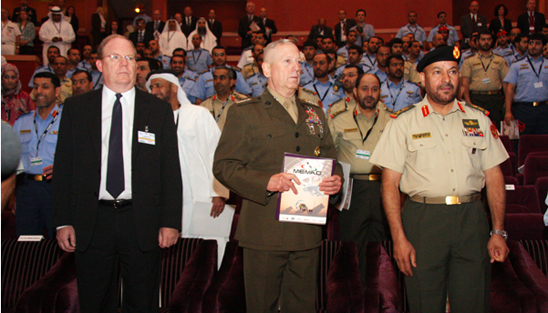 General James Mattis, Commander, Central Command, United States, delivered the second keynote speech. He said that CENTCOM is eager to engage in countering ballistic and cruise missiles and providing a robust missile defense. The theater threat is worsening. Non-traditional security partners are now critical. There is desire for a common regional reaction and critical collaboration that needs to be multi-lateral. The third keynote speech was delivered by Major General Ibrahim Naser Al Alawi, Deputy Commander of UAE Air Force & Air Defense. He noted that enemy missiles are becoming better and more dangerous as weapons of delivery than manned aircraft. Technologies are spreading and ballistic and cruise missiles represent a real threat and that is why integration through C4ISR is most important. 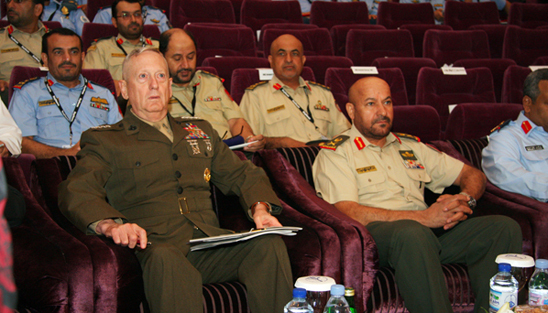 The first plenary session was chaired by Lieutenant General (Ret.) Stanley Green, the Vice President of International Business Development, Air and Missile Defense at Lockheed Martin. 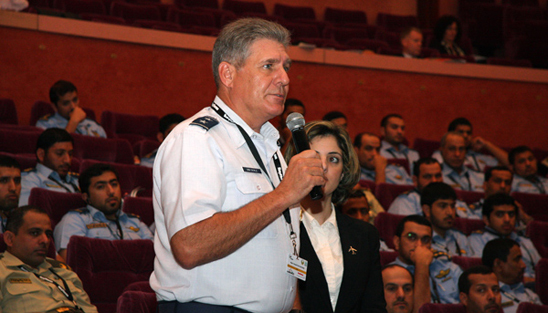 Major General Richard Shook, the Mobilization Assistant to Commander of the US Air Forces Central Command, made a presentation on "Regional Integrated Air and Missile Defense – The Operational Picture", where he presented the challenges of coordinating regional partners. Shook stressed communications kits are most important. 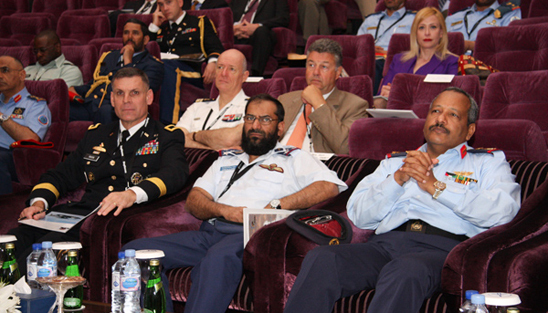 Brigadier General Mohammed Murad Hassan Al Baloushi, a commanding officer of the UAE Air Force & Air Defense made a presentation that TBM development is not new on "Region-Specific Challenges in Building an Integrated Missile Defense Shield". He said that countermeasures and coordination is a slow process and that progress is being made. The last panelist in this session was Brigadier General (P) David Mann, the Commander of the 32nd Army Air & Missile Defense Command from the U.S. His presentation was entitled "A Regional Approach to Missile Defense - The Integrated Air and Missile Defense Center (IAMDC)". He discussed that the IAMDC is now operational in Abu Dhabi. This state of the art facility will be finished in the 2013-1014 time frame and shows the path forward in terms of interoperability. The second Plenary Session was moderated by His Excellency Major General (Ret.) 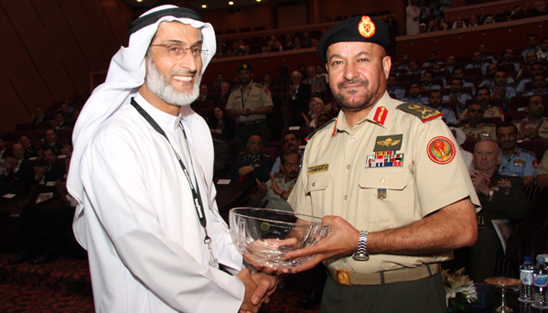 Khaled Al Bu Ainnain the Former Commander of the UAE Air Force & Air Defense and President INEGMA. Mr. Clayton Holt, Middle East Division Chief at the Directorate of International Affairs of the U.S. Missile Defense Agency, presented a paper on "Ballistic Missile Defense Overview", where he considered that ballistic missile technology is spreading rapidly. He also gave a global overview of U.S. anti-ballistic missile programs. Captain Hervé Boy, Chief of the Program Expertise Office at the French Navy Headquarters, briefed the audience on "Maritime Assets and Interoperability in the AMD System". Captain Boy suggested that the need to understand how maritime capabilities interact with land and sea. From this naval perspective it is clear more practice exercises are needed. 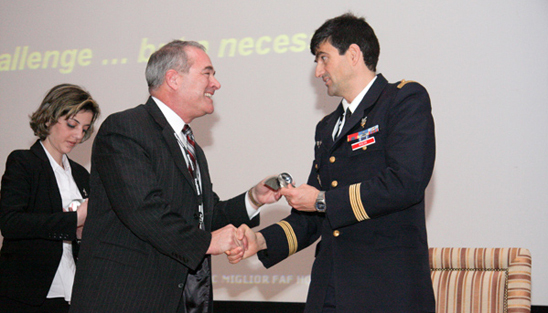 "Integrated Air & Missile Defense - A Theater Imperative" was the headline of the presentation made by Major General (Ret.) John Urias the Former PEO, Missiles & Space and Deputy Commanding General at the U.S. Army Space and Missile Defense Command (SMDC). He suggested that the foundation already exists now for a regional air defense system and that shared awareness and solutions are being crafted. The final Plenary Session of the day was moderated by Mr. Riad Kahwaji. 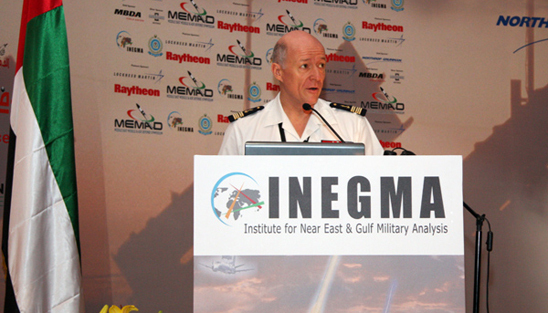 INEGMA's R&D Director, Dr. Theodore Karasik, looked at "Developments in Regional Threat Environment and Interoperability". He argued that the threat environment is shifting and that the UAE possesses the backbone necessary for GCC-wide integration. Major General (Ret.) Tommy Crawford the Former Commander of the U.S. Air Force Command and Control, and Intelligence, Surveillance and Reconnaissance Center, United States examined the "BMC2 Interoperability and Integration". 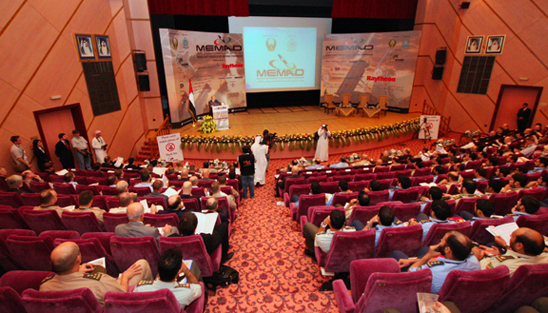 MEMAD will discuss on Monday the following subjects: "UAE Network Enabled Capability: A Local Solution to a Global Problem", "Adapting to Seize the Opportunities of Technology", "Reducing Risks and Consequences with the Deployment of Theatre Ballistic Missile Defense", "Consolidating Extended Low Tier Air Defense". Two Plenary sessions took place n the second day, followed by specialized closed workshops in the afternoon. Major General (Ret.) John Brooks the Vice President of the International Business Development & the President of Northrop Grumman International moderated the first plenary session. 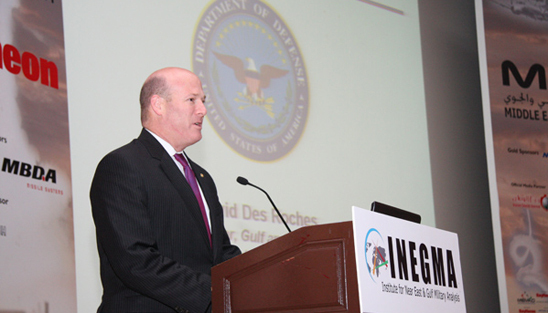 David Des Roches the Director of the Gulf and Arabian Peninsula at Office of the U.S. Assistant Secretary of Defense, argued, in his presentation on "Adapting to Seize the Opportunities of Technology", that historical examples can help guide future planning. He added that British and Libyan experiences illustrate key turning points. H.E. Major General (Ret.) 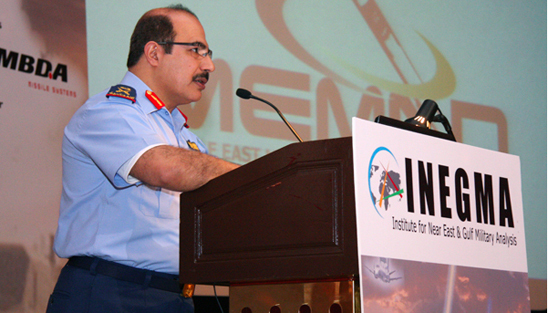 Khaled Al Bu Ainnain, Former Commander of the UAE Air Force and Air Defense and INEGMA president, said in his session on "Reducing Risks and Consequences with the Deployment of Theatre Ballistic Missile Defense" that GCC airspace is safer and that GCC coalition ballistic missile defense is cost-effective. Dr. Mohammed Al Ahbabi from the Center of Excellence & Development at the UAE Armed Forces presented a paper on "UAE Network Enabled Capability: A Local Solution to a Global Problem" where he considered that network enabled capability is a combination of concept, transformation, and communication systems represented by YahSat. 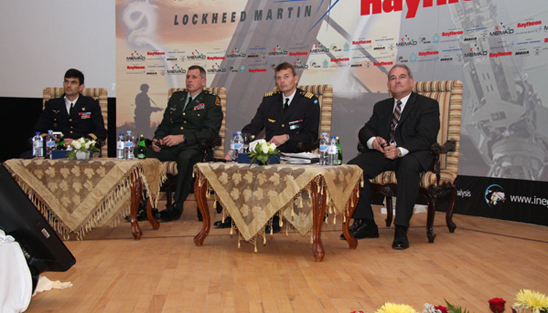 The final plenary of the conference was chaired by Major General (Ret.) 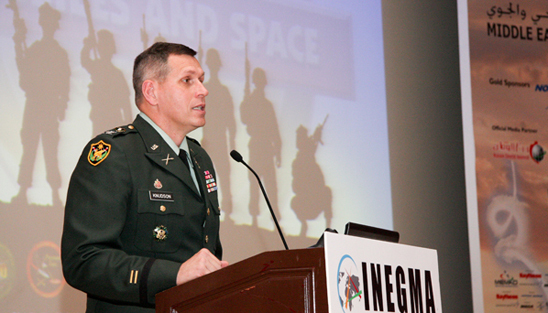 John Urias, Former PEO, Missiles & Space and Deputy Commanding General at SMDC. 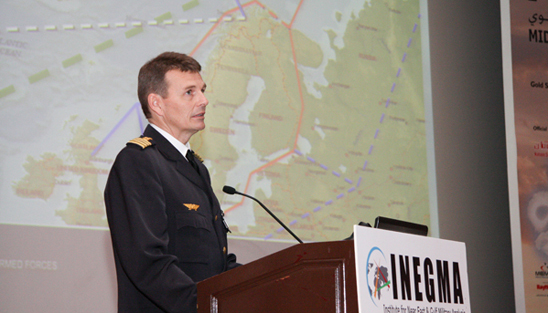 Colonel Per Nillson, the Commander of the F21 Wing at Swedish Air Force presented a paper on the "Integrated Air Defense – A Swedish Perspective". He said that his country's network centric warfare and interoperability is designed based on manpower which is relatively small. 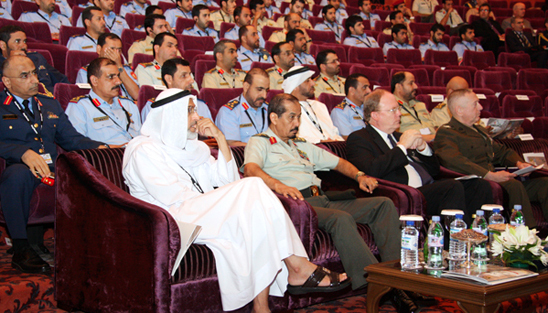 Colonel (P) Ole Knudson PEO of Missiles and Space at the U.S. Army briefed the audience on " US Army Missiles Overview". He discussed U.S. products for missiles and space in the areas of development, procurement, sustainment, and functional control systems. The final presentation was on "Consolidating Extended Low Tier Air Defense" addressed by Colonel Marc Miglior, Project Officer in Charge, Air Defense and Ballistic Missile Defense at the French Air Force HQ. He said that integration in the French Air Force is based on the p hilosophy of global aerospace and expanded air defense. 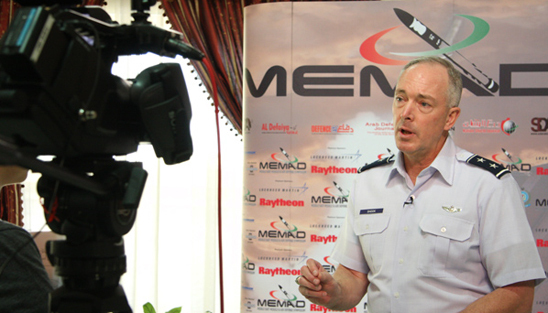 MEMAD was designed to keep its regional and invited participants abreast of the latest developments for national missile defenses, whether in the technological realms or the intellectual. 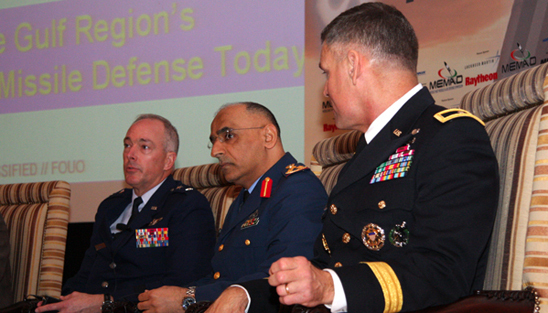 Uniquely adapted to the Middle East-specific threat environment in consultation with key informed officials and security experts, with a special focus on GCC efforts to realize C4I enabled missile defense operations that achieve horizontal integration and shared early warning between member states, it delivered to a high quality precisely what the organizers and its supporters had planned for. 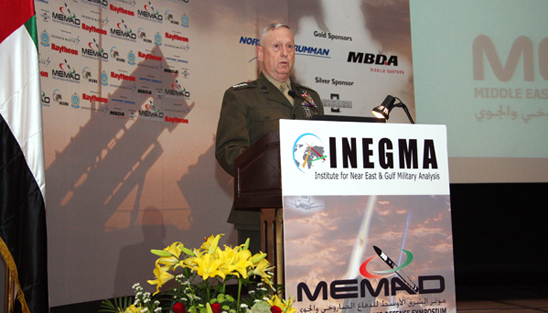 MEMAD was established to facilitate informed discussion between decision-makers from around the Middle East as they assemble some of the most effective missile and air defense systems anywhere in the word. 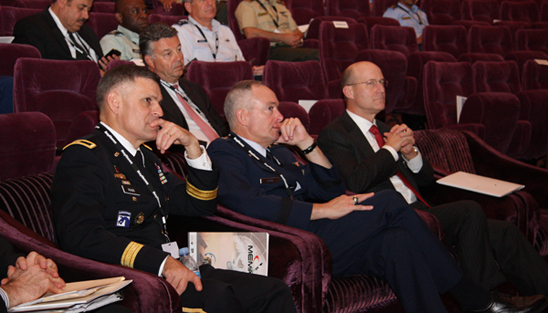 MEMAD is a two-day event which features around fifteen presentations, five panel discussions, and four closed workshops around focused core themes associated with developing and operating multi-layered missile defenses. 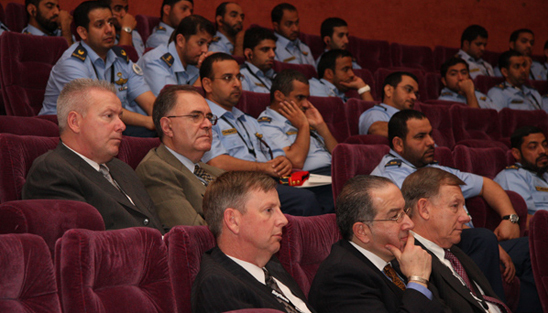 MEMAD is a meeting point for government and military officials alongside the private sector. Defense industry participation from leading solution providers in air and missile defenses can take three forms: Sponsorship, Exhibition, or Attendance. In 2010, MEMAD will feature a highly focused small-scale exposition – for further details on Sponsorship and Exhibition Opportunities can be found by clicking on the tabs located at the top left.